I'm proud to announce the public release of the Furniture Library Editor, a long awaited tool that will help Sweet Home 3D users create and manage SH3F files. The program is available as a 10 MB JAR executable file (see the end of this post for updated links), and requires you installed Java 6 to 8 on your machine (or reuse the Java version embedded with Sweet Home 3D installer). Supported system are Windows, Mac OS X 10.4 to 10.14, Linux 32 bits and 64 bits. This tool will let you import more than a piece of furniture at a time either with a classic file dialog displayed by the Import furniture tool, or by dropping the files in the window of the tool if your system supports this feature. Once they are imported, you may modify each piece one by one, or by group after selecting them. As the screen capture shows, the modification dialog displays all the attributes of a piece of furniture (for those interested it's even possible to edit prices or resizable attribute after a small modification in program). Compared to the Import Furniture wizard available in Sweet Home 3D, I also added an ID text field (when a piece has an ID, any other piece with the same ID won't appear in the furniture catalog of Sweet Home 3D), a Creator text field, 3 buttons to multiply size by common values (x 10, ÷ 10, x 2.54). The 3D preview allows zoom and rotation around two axes, and each time you drag and drop the mouse in the 3D preview a new icon is created for the current piece. This tool is also a translation tool that will help translators to localize more easily SH3F files: the name and the category entered in the modification dialog depends on the language chosen in the tool bar, and when you select a new language in this drop down list, all the categories belonging to the 10 default categories of Sweet Home 3D are automatically translated into the selected language, if the language belongs to the 16 ones supported by Sweet Home 3D at this time. Caution, there's no undo/redo feature. I didn't feel it was really necessary. As always create backups to ensure you won't loose your work. This editor should be stable, but I release it as a beta version, because there are probably still some small bugs. For interested programmers, source code is committed in the FurnitureLibraryEditor SVN module separated from SweetHome3D one. Furniture Library Editor project is derived from Sweet Home 3D project and uses a similar MVC architecture. I hope this tool will be useful and that you'll like it. 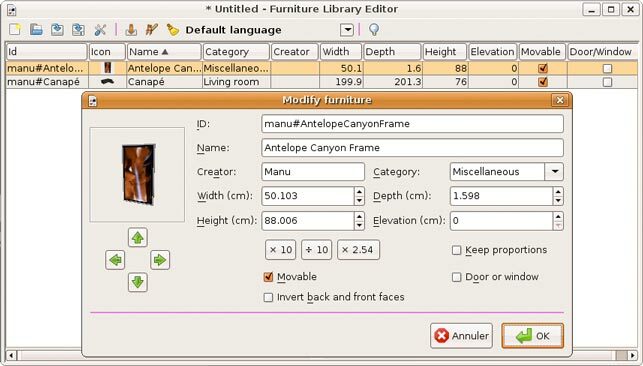 Furniture Library Editor 1.2 was released on 11/30/2010. I removed the ID column and the ID info for newly added furniture as it's useful for only very special cases. Ca foncionnait la premiere fois! Ma vie sera plus aise des aujourd'hui! Hans, it's great you like it. I fixed a few bugs in it this morning, so please download the update (the about dialog will display version 1.0 Beta 6). - When you right-click in the list with imported items, the last selection says "Selectionner tout". I guess that should be "Select all"
- I make a new library by importing the models with "Import furniture" and then I save it with "Save library in a different file". "Create a new library" seems to work as a "clear screen" command, and only deletes the library that is in memory? Maybe the names of these command should be changed? Thank you Hans for your feedback. I updated the editor accordingly. This editor is a mono window application, so when you click on Create a new library or Open a library tools, the current furniture list is discarded (after a warning if you didn't save it). - subcategories for FLE and TLE, so that large sets of models and/or textures are easier to manage. Example: the category Living Room can have the subcategories Tables, Chairs, Couches, Cupboards, etc. Only had a very quick go with it so far, initial thoughts, what a great application! Will you also be adding it to Sweet Home as a plug-in or is it staying as a standalone? I wanted to make a desktop launcher (on my Linux system) but I couldn't get the command right so that did not work. Right now, I just have to remember where the file is and right click that and select to open with java. I just updated the Beta version of the Furniture Library Editor with the fix for better DAE/Collada support. This tool will probably be released in the coming days with Sweet Home 3D 2.5. I updated the Beta version of Sweet Home 3D 2.5 too, and now you can import again existing SH3F or SH3T files without being obliged to relaunch Sweet Home 3D.